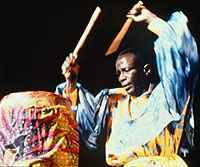 Doudou N’Diaye Rose (born July 28, 1930 in Dakar, Senegal - died August 19, 2015 also in Dakar, Senegal), chief drum major, founder of the Drummers of West Africa, was the most famous griot in Sénégal. Today his fame goes beyond the boundaries of Sénégal. He’s been touring the world for over two decades and recently in 1996 his drum ensemble was the center of attention at the opening of the National Black Arts Festival in Atlanta, Georgia. He was unquestionably the most famous sabar master in the world.